This Hallowe’en BIRSt celebrates the very special anniversary of Frankenstein, authored by Mary Shelley 200 years ago. Recorded at the Frankenstein Unbound conference as part of the ongoing festivities around the Shelley Frankenstein Festival. 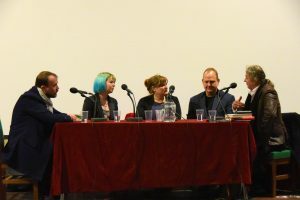 Join us to hear different perspectives on the monster that is Frankenstein and its legacy in cultural heritage, impact and practice; also find out about the panels own work and their favourite adaptations of the text. Held in the evocative location of St Peter’s Church Bournemouth, the place where author Mary Shelley, her mother and the very heart of her husband Percy are buried. *Dr Brad Gyori’s Shelley’s Heart launched after the event – click here for full information and experience the interactive drama at this location. Previous Post: « Frankenweenie Reimagined in 6 BBC SFX : It’s Alive!